Giving proper credit, this mantra came from an article in Runner’s World called “Run and Retweet.” Runners were asked to give their best advice in 140 characters or less and I loved just about every one of them. Run the mile you are in. Never make decisions while going up a hill. Don’t say anything to yourself that you wouldn’t say to a friend. And more like those. One Tweet, which I originally applied to running, has become my personal mantra for November. Saying “everything forward” on a ten mile run makes total sense, but it also applies when you’re nearing 15,000 words of a 50,000-word novel. Just keep writing. Keep going. However you can. 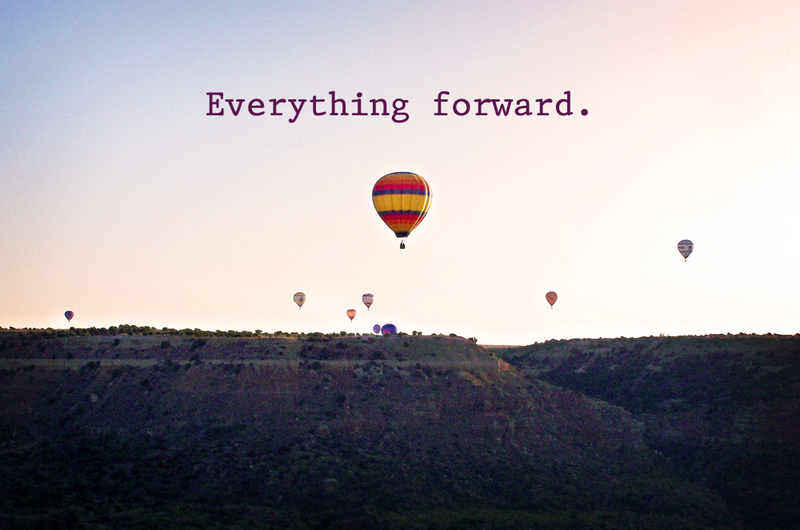 Everything forward. This photo was taken in October 2009 when I wrote a story for Amarillo Magazine about hot air ballooning. It was my first and only experience in a hot air balloon and it was so beautiful that I haven’t forgotten a single detail. The thing about navigating a hot air balloon is that you can’t. There is no steering wheel, no brake, and certainly no air bags. You turn on the flame and go up. The wind does the rest. I’m not sure what direction I’m going with this novel as far as the whole project is concerned, but my plot is moving forward and my word count, as of last night, is 13,729. Everything is moving forward, and as long as I’ve got a fire in my soul to fuel it, I’ll keep going that direction.